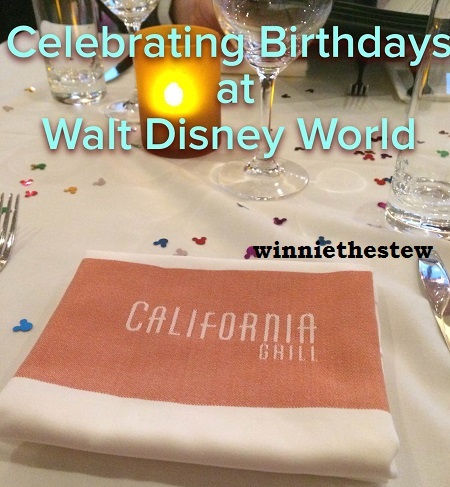 Are you celebrating an upcoming birthday at the Walt Disney World Resort? Want to make the day extra special? Here are some thoughts and ideas to celebrate the grand occasion that happens just once a year. When planning your Advance Dining Reservations, make sure to tell the cast member that someone in your party has a birthday. They will make a special note in your reservation and ensure that there is a magical happening during your dining experience. The surprises vary; however generally a celebratory cupcake or small dessert should be expected. For the kids…consider booking a makeover at the Bibbidi Bobbidi Boutique or The Pirate’s League. Plan a special meal like a character meet-and-greet at Cinderella’s Royal Table or one of 8 other restaurant options found throughout the Disney Resort. Sail the Seven Seas Lagoon with Captain Hook and Smee on the Pirates and Pals Fireworks Voyage for a celebration full of singing, adventure and storytelling. The cruise anchors so that guests get an incredible view of the Wishes fireworks from the Magic Kingdom park. For family celebrations, custom cakes are obtainable through the Disney Bakery. Chocolate and vanilla cakes are available for purchase in most table service restaurants and do not require advanced ordering. If you wish for a more elaborate cake, or one bearing a favorite Disney character, contact Disney at (407) 827-2253 to place your order. Disney cake creations can be as simple or as magical as you wish! Room decorations are a wonderful surprise for a special day. Disney Floral has in-room celebration packages that include everything from a bouquet of flowers to a full room decoration to enjoy upon your arrival to the resort or back from a day at the parks. The room decorations through Disney can get rather costly. You can bring your own decorations and create an in-room celebration! Stop by your local party store for garland, paper table toppers, balloons and special treats to create your very own Disney themed party! You can decorate your room either while the little ones are sleeping or out for a walk at the resort. When making your reservation at a Disney hotel, be sure to note if a member of your party is celebrating a birthday. Upon check-in, the cast member may give you a special birthday pin. If one is not available in your hotel, go to the Guest Services location at the entrance of any Disney Park to get a pin. Wearing a birthday pin is a fun experience in the parks. Cast members and even other guests will grant “Happy Birthday” wishes throughout the day. Sometimes cast members walking in parades will high five or shake hands with a guest celebrating a birthday. Disney knows that guests enjoy a little extra on their special day and they make sure to go out of the way! Plan ahead and ensure that your birthday celebration is truly a magical experience! ← Try a Ticketed Event To Get the Most Out Of Your Trip.